MBTA: Melrose can be accessed through MBTA Commuter Rail stops at Wyoming Hill, Melrose/Cedar Park, and Melrose Highlands. Oak Grove, the northern terminus of the Orange Line, is located just outside of Melrose city lines in Malden. The city itself lies in the center of a triangle created by I-93, I-95, and Route 1. 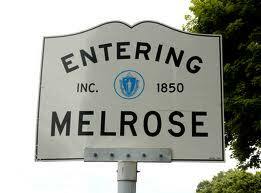 Located seven miles north of Boston, the city of Melrose was originally called “Ponde Fielde” for its bountiful ponds and streams or “Mystic Side” due to its location north of the Mystic River. The town was thought to resemble the hills of Melrose, Scotland, thus earning its name. Melrose is a center for healthcare, containing a small non-profit hospital that was home to the world’s first cochlear implant and laser surgery. It was also one of the first hospitals in the country to offer same-day surgery. A notable citizen of Melrose is local celebrity Don Orsillo, former Red Sox NESN announcer.